Many parents feel like their kids are out of control at one time or another. But usually, that feeling is fairly fleeting. For some parents, however, out of control kids have become the norm. Their children refuse to listen, break the rules, and couldn't care less about consequences. 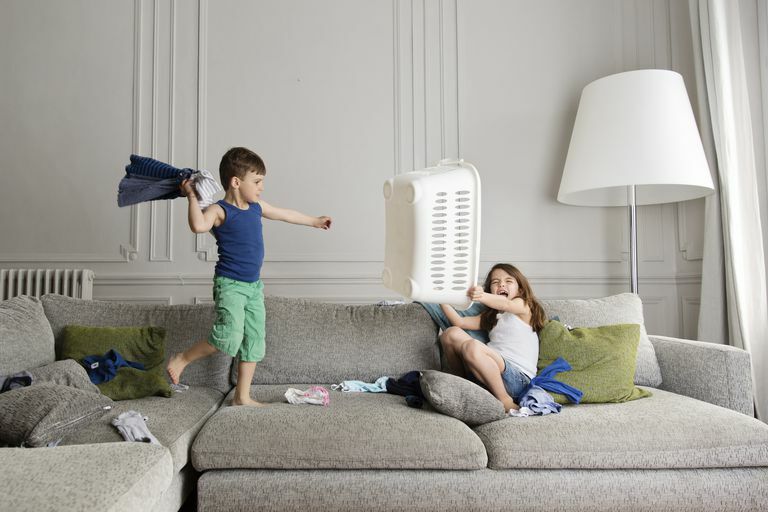 If you're feeling like your kids are out of control, take steps to regain your power. Maintaining your authority is important to your child's well-being—and it's important for your own emotional health too. Believe it or not, kids like rules and limits. Kids feel safe when they trust their parents are good leaders who can set and enforce rules. When children don't trust that their parents can maintain order, they experience a lot of distress. And that distress can lead to even more behavior problems. Establish household rules. Reduce the chaos by creating a clear written list of rules. Focus on basic rules like "Use kind words," and "Ask before borrowing items." Rules can be more easily enforced once they're written down and discussed as a family. Create structure to your children's day. Get the family on a routine by introducing more structure into your child's day. Create time for homework, chores, dinner, family activities, and play. Then, try to stick to the schedule as much as possible on weekdays. Assign chores. Whether your children are 4 or 14, it's important to assign regular age-appropriate chores. Get your children used to pitching in so they can practice being responsible members of the family. Use grandma's rule of discipline. Focus on what your kids can do, rather than what they can't. So instead of saying, "No TV until you've cleaned your room," say, "You can watch TV as soon as your room is clean." Offer positive choices that will give your child a little bit of control. Give effective instructions. The way you give directions matters. Be firm and direct and only give one instruction at a time. Use a calm voice and make sure you have your child's attention before you speak. Establish clear consequences for breaking the rules. It's important to be consistent with consequences. When your children know each rule violation will result in an immediate consequence, they'll be less likely to misbehave. Time-out: Time-out works best for children under age 8. If your child refuses to go to time-out, or he won't stay in time-out, don't force him. Instead, take away a privilege. Take away a privilege: Take away electronics, a favorite toy, or an activity from your child. Just make sure you don't take those privileges away for too long. Your child may give up or may act worse if you take away too many privileges or you remove them for days or weeks at a time. Restitution: If your child's misbehavior affects someone else, restitution may be in order. Tell him to do a chore for someone he hurt or have him loan his favorite toy to the victim. Logical consequences: Give your child an opportunity to take responsibility for her behavior. If she colors on the walls, make her wash it off. If she breaks something, make her pay to fix it. Don’t be discouraged if your child's behavior seems to get a little worse before it gets better. When you start giving consequences, an out-of-control child will push back. Once he sees you are serious about following through with consequences, his behavior will likely calm down. If your child isn't motivated to follow the rules, she may need some extra incentives to keep her on track. Use positive reinforcement to motivate her to follow the rules. Offer praise: Catch your child being good. Say things like, "I appreciate that you put your dish in the sink," or "Thank you for playing so quietly while I was on the phone." Positive attention can go a long way toward motivating kids to keep up the good work. Reward good behavior: Whether you create a sticker chart that targets one specific behavior or you make a behavior chart that keeps track of several behaviors throughout the week, tangible rewards can lead to behavior change. Keep in mind there are many free and low-cost rewards that work as good motivators. One excellent idea is to go to your local dollar store and load up on items for your child to choose from. Establish a token economy system: Show your child that privileges, like playing video games or going to the park, must be earned. Establish a token economy system that allows your child to cash in his tokens for privileges. If your discipline strategies aren't working, seek professional help. Start by talking to your child's pediatrician about your concerns. A physician may be able to refer you to appropriate service professionals in your community. A professional may be able to provide you and your children with interventions, skills, and support that will help you regain control of the household. Parenting coaches and parenting support groups can also be valuable resources. Hesari NKZ, Hejazi E. The Mediating Role of Self Esteem in the Relationship Between the Authoritative Parenting Style and Aggression. Procedia—Social and Behavioral Sciences. 2011;30:1724-1730.